During the school year, I like to compile a rotation of healthy breakfast recipes with staying power. The easiest way to do that? Making sure the recipes are powered by protein-packed dairy, like these Banana Split Greek Yogurt Pancakes. These tasty, filling pancakes are chock full of Greek yogurt and milk, and they are 100% kid approved. Strawberry-banana Greek yogurt adds protein and a tasty hint of fruity flavor. You can even freeze these and quickly reheat for an easy and filling breakfast on busy school day mornings. Experts recommend three servings of lowfat or fat-free dairy foods every day, yet most of us need to add one daily serving of nutrient-rich dairy to help meet recommendations. Adding Greek yogurt to recipes is an easy way to fit in an extra boost of dairy! Pancakes are best enjoyed with a big glass of milk! Kids who drink milk when they are young are more likely to drink milk as adults. Plus, lifelong milk drinking is linked to stronger bones, a healthier heart and less chance of developing diabetes. These are the best-tasting, fluffiest, healthiest pancakes your family will have all school year! Preheat your griddle to 350-400°F. Alternatively, heat a skillet over medium heat. In a medium mixing bowl, whisk together the eggs, Greek yogurt, milk, sugar and vanilla extract. Add in the flour and baking powder, then mix into the wet ingredients. Once the griddle or skillet is heated, spray with nonstick cooking spray. Use 1/3 cup of batter for each pancake. Flip once the batter on top starts to bubble, about 2-3 minutes. Cook on the other side for another 2-3 minutes, then remove from the griddle or skillet. Stack 2-3 pancakes per serving. 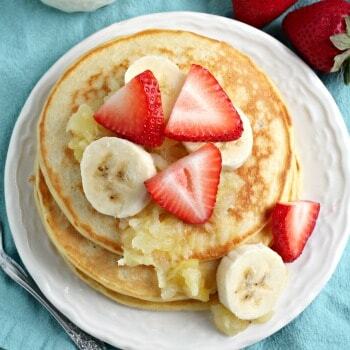 Top with about 2 tablespoons of crushed pineapple, a few strawberries and banana slices. Serve immediately. Enjoy! To reheat, simply remove from the freezer bag and stack the pancakes on a microwave-safe plate removing the pieces of parchment paper between each pancake. Heat in the microwave on high for 30-45 seconds or until heated thoroughly. Carrie lives in West Virginia and is a blogger, recipe developer and the stay-at-home mama of a preschooler and a teenager. 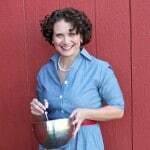 She cooks, bakes, and mixes a drink or two. She also has a passion for travel and shares that love with her family. You can find her sharing her budget friendly recipes, money saving tips, and family friendly travel adventures over on her blog, Frugal Foodie Mama.